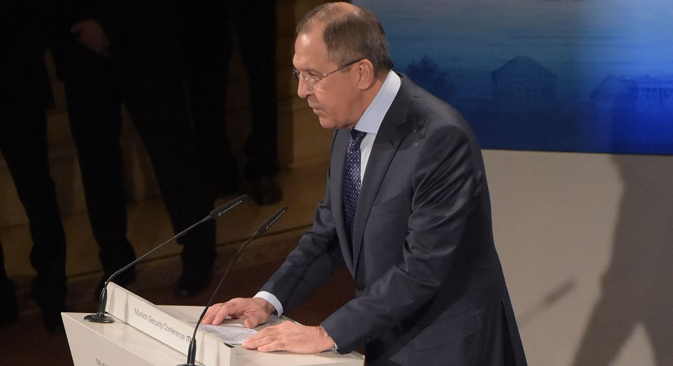 Lavrov’s Munich speech: What does it mean for the Ukraine crisis? The Russian foreign minister’s speech at the Munich Security Conference on Feb. 7 has been described by Russian experts as “tough” and “predictable.” According to them, Russia has drawn a line as regards the Ukrainian crisis and is now waiting for decisive action from Europe. RBTH asked Russian observers for their reactions to Lavrov’s speech. Coming shortly after fresh attempts to resolve the conflict in eastern Ukraine, the 51st Munich Security Conference on Feb. 7 saw the agenda dominated by the Ukrainian crisis, with a hard-hitting speech by Russian Foreign Minister Sergei Lavrov provoking much debate among Western elites. The Russian foreign minister went on to make numerous further references to European security and the conflict in Ukraine, none of which were in any way optimistic. However, few observers believe that this is a likely outcome, with many warning that the confrontation over Ukraine is set to continue, such as Andrei Suzdaltsev, deputy head of the department of the world economy and politics at the Higher School of Economics in Moscow. In his opinion, Europe is still far from starting to act without agreement and approval from the U.S., which is opposed to softening its rhetoric toward Russia. Contrary to views expressed by other pundits, Suzdaltsev does not anticipate that a serious rift will develop between Europe and Washington over Russia. “Russia’s position in Ukraine is not a priority for Europe now,” he says. All experts polled by RBTH agree that in terms of its tone, the Russian foreign minister’s speech in Munich was particularly tough. Having said that, they point out that Lavrov did not say anything drastically new. Dmitry Danilov, meanwhile, acknowledges that while German Chancellor Angela Merkel’s address to the Munich conference represented an attempt to somehow soften the West’s extremely critical position towards Russia, the Kremlin was awaiting more substantial action.